Collective Architecture are very excited to be leading a team of designers developing a feasibility project as part of the Cumbernauld Living Landscape Programme. 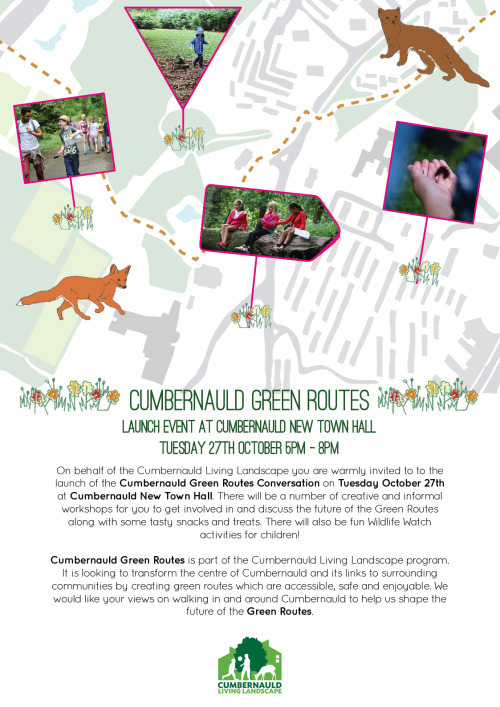 Cumbernauld Green Routes investigates the quality of existing routes and how they can be improved for both people and wildlife. The aim of the project is to create links through the town centre and to surrounding communities by creating green routes that are accessible, safe and enjoyable. We are working with Scottish Wildlife Trust, AECOM and Pidgin Perfect who are leading the Participation aspect of the study. A launch event will be held on 27th October at Cumbernauld Town Hall (5-8pm) where there will be creative workshops for all ages.